"Shin Kotoba (新ことば)":We produce KANJI words & designs for you that aren't in dictionaries yet! Does your company seek for a keyword for ad in Japanese that can show its concepts, advantages, or ideals? Does your company seek for a keyword for ad in English that can show its concepts, advantages, or ideals? Does your company plan to use your website for iPad? If so, do you need pages that nicely show your company’s concepts, advantages, and ideals? 字天 (JITEN) is a designing & copywriting office that can give you a solution for challenges like that! We create an original Japanese keyword with its kanji design for your company to order ,that we call “Shin Kotoba (新ことば)”! 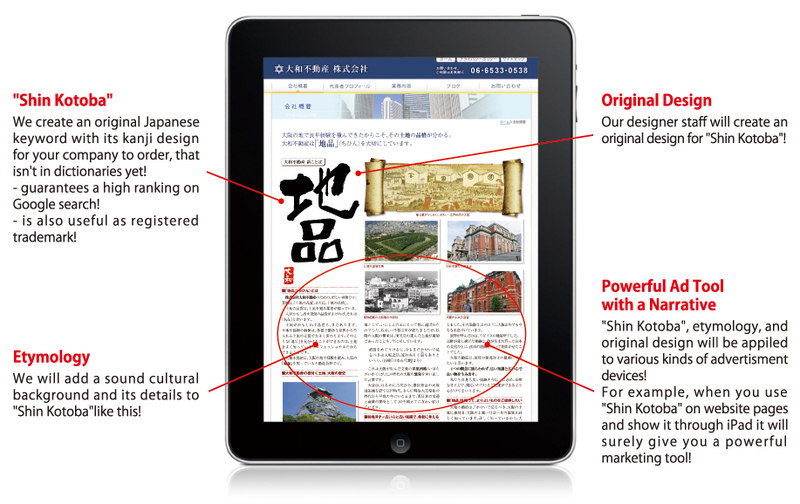 Plus, we can prepare its details both in Japanese and English for the use in your website! Our service begins with an interview. Our staffs will hear from clients in a free-talk style. Clients can freely talk about their goals, concepts and ideals they bear in mind. We will hear them sincerely. Based on the interview, we will make a new word. Plus we will add a sound cultural background and its details to it, so our new word has the 'etymology' that is derived from what we understood through, and were inspired by, the interview. 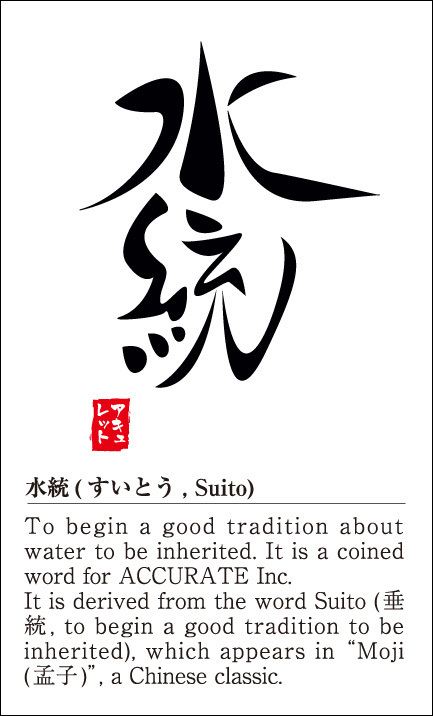 We will give you the rich and elegant 'etymology' both in Japanese and English. After we give you a new word, we will be able to continue giving you our supporting services around it in various ways. For example, an image of "Shin Kotoba" (new KANJI word) on tablet PC like iPad can be seen below, and you can take advantage of it for your business. You can take advantage of "Shin Kotoba" to build a corporate identity with a Japanese taste. Original Kanji words and designs can be used for your products in various ways. You can take advantage of "Shin Kotoba" in your advertisements, or other marketing devices. You can apply our products to your business as you will, and our office is ready to offer you consulting services of design and copywriting for applications like them!